This page contains a strategy guide for the Snow Kingdom in Super Mario Odyssey. The guide includes the location for each Power Moons in the kingdom. This page contains a strategy guide on the Snow Kingdom found in Super Mario Odyssey Race. The guide contains walkthroughs for each location in the kingdom, as well as the location for each Power Moon in the area. The Snow Kingdom is based on the snowy mountains of Nepal. Its greater location, Shiveria, has both a sunny zone and a very snowy zone. In addition, the Shiveria also has a race track where Mario will race against the residents of the kingdom. 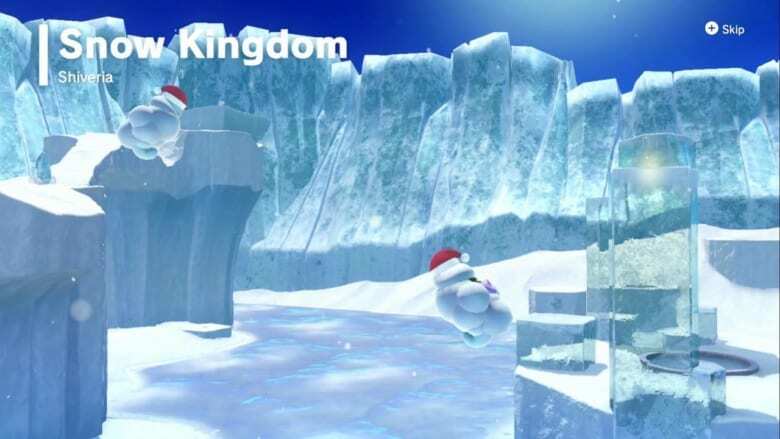 Before you head towards the blizzard, quickly check behind the Odyssey to get some Snow Kingdom Purple Coins. Afterwards, move to the northeastern section until you reach a narrow slope which ends to a cliff. There will be two icicles on the ground where you can jump down to a platform below. Use Cappy to release a torrent of air that can assist you to get back on top. Continue moving towards the new path – remember to use the icicles as markers, and avoid falling into the cold waters. You’ll reach a pathway that circles a new island. That’s where you’ll find a checkpoint. After reaching the checkpoint, you will hear sleigh bells ringing. Look for a destination marker that is covered in snow. You will find a well where the sleigh bells are coming from. Drop down there to get to Shiveria Town. Once you get to Shiveria Town, talk to the townsfolk and look out for some Snow Kingdom Purple Coins and a Power Moon, as well as a Warp Pipe. Look for a Crazy Cap Shop and for another Power Moon. Talk to one of the Shiverians who are watching Bowser’s ship that’s circling around the location of the missing Frost-Frosted Cake. Climb up the pole and clear the mounds of snow to get to the Second Floor and get another Power Moon. Clear another big mound of snow to clear a path that leads to a hallway and another Power Moon. There will be four different areas from the main hall, all of which have Power Moons. Use the wandering Goombas to reach and cross the narrow bridge. Wait for an icicle to fall and make a makeshift-stairway that leads to a pressure plate that is shaped like a Goomba and has a Number 4 on it. There is a Power Moon inside. Be careful of falling debris while you traverse the succeeding platforms. Run under the circular shadows and avoid the falling icicles and the big one to trigger a full roof collapse and where you’ll get another Power Moon. Light one of the four torches needed to unlock one of the barriers. Afterwards, return back to the main hall. In this stage, you’ll need to collect five Moon Shards to complete the Power Moon. You should be able to see where the locations of the five Moon Shards. However, be careful not to get hit by the Bitefrosts – the lurking shark-like monsters under the snow who casts a silhouette before breaching and clamp their jaws. Save the last Moon Shard on the back end of the map for last – once you get the last piece, a Power Moon will show up on a high platform. You’ll need the Bitefrosts to push you upwards towards a handhold where you can shimmy towards an area with another Power Moon. Afterwards, you can then go grab the main Power Moon on the high platform, and light a new torch to clear the level. Immediately upon entering the area, look behind you to get a treasure that is under a patch of snow. A large Ty-Foo will greet you when you venture forth. It will try to knock you into the poison goo. Knock the hat off its head and knock the Ty-Foo out. In the next area, two Ty-Foos are blowing bricks back and forth. You can either disable one of the Ty-Foos or time the bricks to use them as a platform where you can reach a Power Moon at the very top. There will be a final Ty-Foo blocking the end of the stage. Knock off his cap to capture him and use him to blow away the remaining Spinies on the platform behind him. This will trigger the main Power Moon, as well as the lighting of another torch and the lifting of another barrier. Plow through a huge pile of snow that’s on top of the large snowy mountain. Use Cappy to release another wind torrent from the peg that you can use to get onto the higher platform. Clear another pile of snow to make a pathway towards a flower which can assist you to go down the cyclone. Use the other post to create more gusts to help you get back to the top. Remember, though, that there is a secret treasure located behind the post in the back wall. Clear the snowdrift to reach a Power Moon. Go to our Rango (Second Battle) Boss Guide for more information.